Whoa, so many invites. I'm really not that popular... but maybe Leafeon and I are the same. Let's finish talking about this little guy (or gal). Leafeon rocks the regular defense and regular attack. HP is on it's low side, but it's ability Leaf Guard will prevent non-volatile status problems in sunny weather (aka Sunny Day). Keep that in mind for a combo. A combo you say? Well play Leafeon with Sunny Day, Leaf Guard takes effect, then follow up with a Solarbeam. Now you don't have to wait for a recharge. Maybe even partner Leafeon up with a Fire Pokemon? Other moves to consider? Sword Dance, Leaf Blade, Last Resort, Grass Knot, and Synthesis. 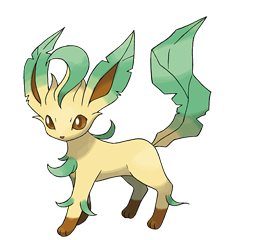 While Leafeon may not be the best stand alone grass Pokémon. Its one of the few that can learn a varied grass move pool. Would you russell your leaves with a Leafeon? Part 2 of this Article will be posted later this afternoon!